It’s gotten quite cold lately. And by ‘cold’ I mean sub-15’C, it’s hardly cold. My girlfriend living in Moscow would be rolling her eyes at that – her idea of ‘cold’ is more like -30’C. Anyway, winter is finally here and so is the cold and wet. When I’m in the mood for something quick, warm and comforting, I go to soups – always a ramen, pho or laksa, and always with extra chilli. I like the spice and the noodles – slurping them up leaves my lips feeling warm and tingly (and sometimes a little of it splattered down my front). I put my ugg boots on as soon as I walked in the door over the weekend and got inspired to make Cookie and Kate’s, West African peanut soup, that’s been sitting in “the pile” for a few months now. 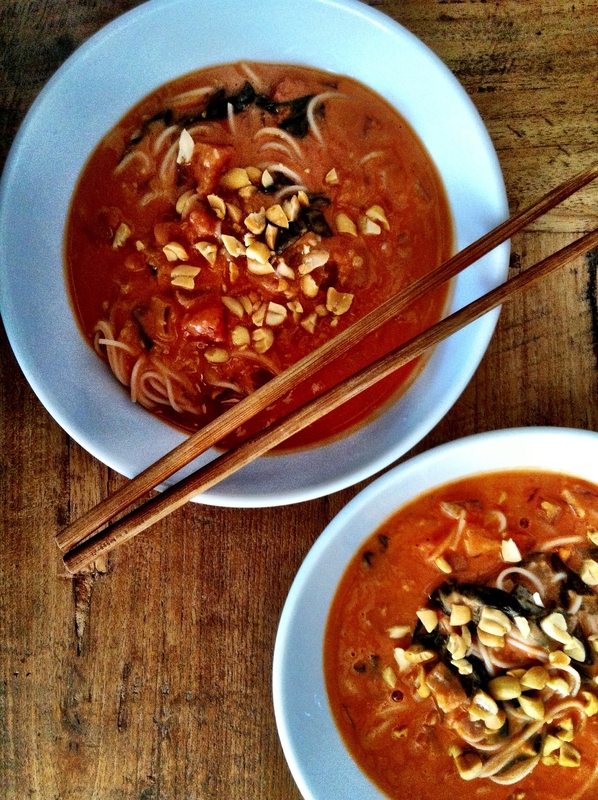 I added rice noodles to this lovely creamy tomato based soup – the hint of garlic and ginger providing just enough warmth. Oh, and I recommend using the crunchy peanut butter! (says the girl who’s not really a peanut fan…). 06 Jun	This entry was published on June 6, 2013 at 6:24 pm. It’s filed under Lucy's plate, Recipes and tagged Cooke & Kate, Peanut, Soup, Vegetarian, West African. Bookmark the permalink. Follow any comments here with the RSS feed for this post.